Due to a very windy forecast we decided to head out for a short walk at a relatively low altitude, as even on the summit of Sugar Loaf the wind was 40mph gusting to 60mph. We decided to head up the small peak of Skirrid, which is to the east of the Black Mountains, and as it turns out has a fantastic view of Sugar Loaf and the Black Mountains. The walk around the base was pleasant, but a bit breezy. As we ascended up the steep north ridge it got progressively more windy, until about 10m below the summit. At this point the wind became exceedingly strong, to the point that standing up was very difficult! 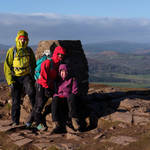 After a very quick walk down the south ridge we were back at the car in time to go for Sunday lunch at the Skirrid Inn. 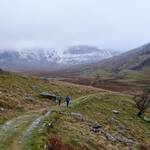 After an unhealthy Christmas and New Year we were keen to get out walking this weekend. 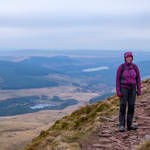 With a cold and dry but very cloudy forecast we headed over to the Brecon Beacons to do the circuit up Craig y Fan Ddu until point 754, before heading over to Fan y Bîg, Cribyn, Pen y Fan, Corn Du and back down the ridge to the lower Neuadd Reservoir. The light throughout the day was very strange due to there being a lower layer of grey cloud and an upper layer of white cloud. We spend most of the delay below the cloud, other than the top of Pen y Fan. It was very cold in the wind, and it certainly felt like our first winter day out this year! Due to a big fell race it was not quite the quiet day out walking we had planned, but it was still enjoyable to be out. It ended up being a 19km walk which we made good time on, we were back home in Bristol by 4pm. Making the most of some stunning November weather Becky and I headed over to the Black Mountain for a weekend of walking. Unfortunately we didn’t check the wind forecast as we assumed that with the wall to wall sunshine there would be no wind, this was a mistake as there was a very strong and cold wind! Thankfully with the walk we completed we were somehow sheltered for most of the day.